If you have plans to scale your Oracle Enterprise Manager Cloud Control 12c installation. On of the ways to improve performance and increase availability is migrate repository form single instance database to Real Application Cluster. Database reconfiguration is incredibly simple with rconfig utility. Instructions are simple and you may use documentation or a numerous posts about. I'd like to share some tips about the very last steps in situation when you can't have both database up together (in my case - single instance became a cluster node). you still can use emctl utility even when old repository is not available.. It will throw a loot of error messages about JPS database availability, just keep it going until server will not be in RUNNING state. From main terminal window run $OMS_HOME/bin/emctl to modify database connection as normal. Descriptor is enclosed in double quotes. After command execution just stop AdmiServer in the second terminal with Ctrl-Break and start Grid Control normally. 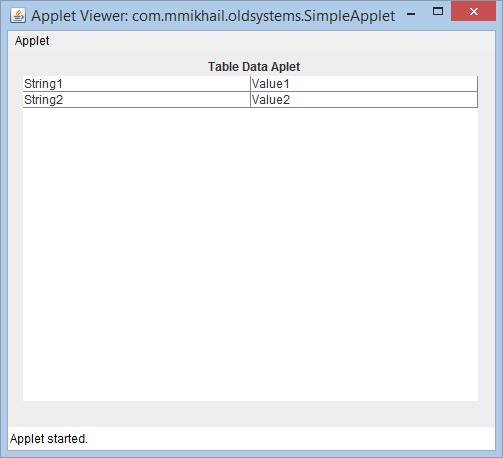 I have created a very simple applet code in JDeveloper. Here is how it looks in Applet Viewer. I don’t care much about applet by itself, I want to make it running under Java 8, but if you need something to test project archive is right there. One of the most important changes in security requirements – proper archive manifest. For JDeveloper it is really simple to implement. 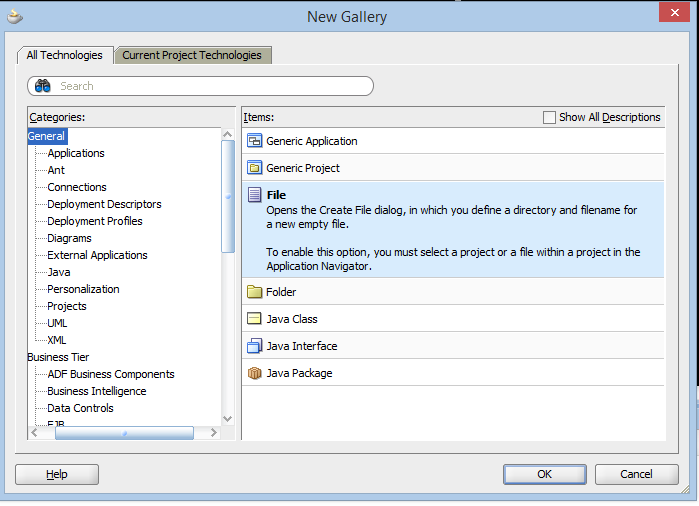 Create new text file in project directory with File –> New – File under General category. 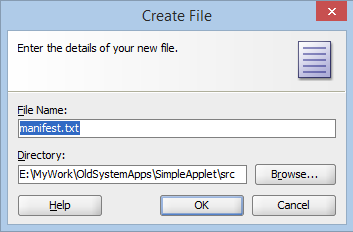 In the new file dialog window name it as manifest.txt and click "Ok" button. Brief content description. “Permissions” property declares that applet code does not require any access to local resources at all. “Codebase” describes domains that we are going to use for. Please pay attention that I put two values, because for codebase www.site.com and www.site.com:80 are different. The last one is quite self-explanatory. You already have JAR deployment profile, don’t you? 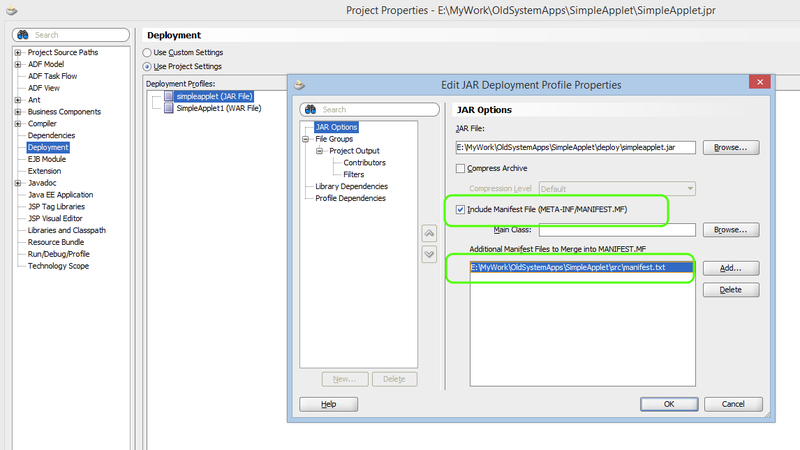 Open Project Properties, Navigate to deployments and open deployment profile for edit. Enable MANIFEST.MF in deployment profile and don’t forget to merge our text document. 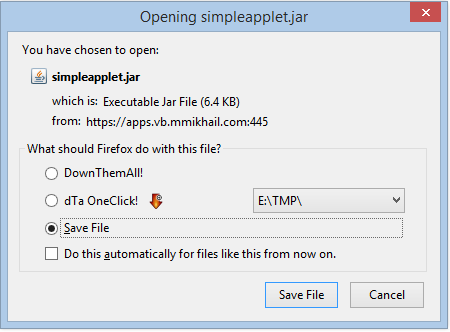 Compile and deploy your project to JAR file. Applet prepared for signing and deployment. Now we need a new certificate to sign our code. This time procedure a bit different, because jarsigner works with JKS storage and you should create one. Open new command window as Administrator. You shouldn't do it if you sign certificates against well known CA. In my case I have to add my private CA certificate into JRE keystore. Create new key store and private key with keytool utility. Is CN=Michael M, OU=Unknown, O=mmikhail, L=Naples, ST=Florida, C=US correct? Return to the command window and get certificates back to workstation. Install certificates to the keystore starting with my personal CA certificate first. I should make my own CA trusted for JRE on my computer. Now we are ready to sign our library and deploy it to Apache server. Transfer library to the server and make sure that it’s available to end users on new virtual host. The last part is about Apex application . JRE 8 has no “Medium” security level – All sources should be trusted and libraries signed. JRE 8 uses TLS 1.2 by default and does not download JAR libraries even from TLS 1.0 sources. I still have warnings mostly because I use non public Certificate Authority and have not implemented Online Certificate Status Protocol. You should be fine with any of big authorities. Hope you it would be helpful. If you work for a company with existing certificate authority, or have service from any of big players – lucky you. Just look this through and get all necessary certificates with CLR and OCSP parts in it. Codebase server with latest TLSv1.1 and TLSv1.2 support to publish our Forms/applets. Before we issue any new certificates, reconfigure CA settings. Java 8 requires every verification for certificate with CRL (Certificate Revocation Lists) and with modern OCSP (Online Certificate Online Status) protocol. I am going to skip OCSP server configuration (Latest OpenSSL versions allow implement it. Here is a good article). Of course, you should use your own server name. Save CA configuration and issue some certificates. I am going to create new virtual host with TLS 1.2 and of course it requires new certificate. 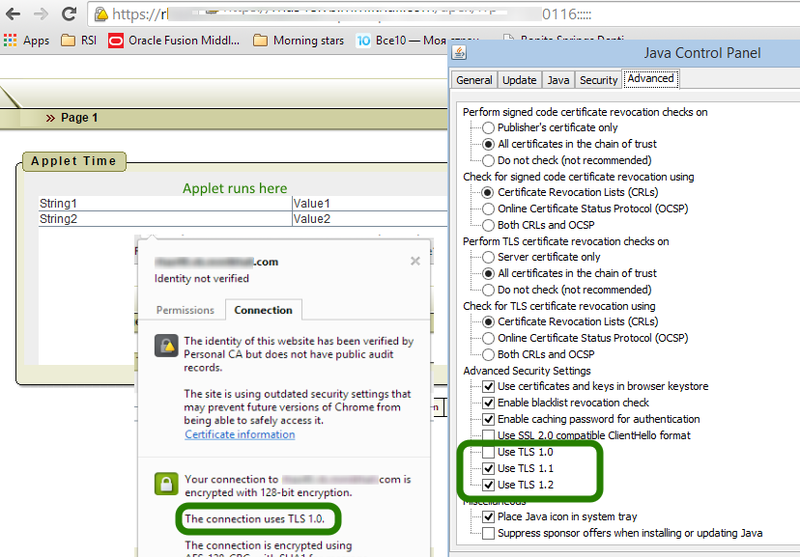 We already have certificate for server name, revoke the previous one and reissue certificate with additional fields. Copy new certificates and keys to Apache configuration directory (I use old configuration directory in /etc/httpd but you free to choose any). We are about to change Apache configuration. Virtual host on port 80 defines permanent redirect to protected server. Virtual host on port 443 describes reverse proxy access to old business application (Oracle APEX 10g). To simulate old Web applications there is only SSLv3 and TLSv1 protocols allowed. Listen port 445 to enable different TLS protocols on the same Apache instance and different server name. We need this port because with named virtual hosts you will have single SSL enabled port with common protocol versions. I am going to use this virtual host for CRL publications and as code base for applets in business applications. Before apply new configuration, I also made some changes in hosts configuration. Now it's time to get workstation ready.